Have to admit that this Holiday season has been a little bit of a struggle for me. This is the first year EVER in my adult life that I have not had my own house or my own space. For a nester personality like mine - it has felt a little weird to be living out of a suitcase some days. Granted, it has also been very freeing. Without "stuff" to take care of to clutter up my brain, I have been able to travel and to really enjoy the little things and the natural beauty that surrounds us. Before I left for San Francisco a few weeks ago, I had Alex drag up my mom's faux tree out of the basement... and then I just kept looking at it. Even though it's all set to go with lights, I could not bring myself to even plug it in. Depressing. Tuesday night, while watching my favorite movie of all time "Gone with the Wind", I finally decided to unpack my carefully wrapped seashell and beach ornaments. 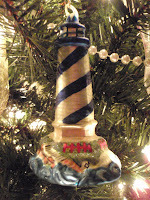 Maybe I would feel better if I decorated the tree with my coastal flair. White lights, a great bonus once I finally found an extension cord and plugged the darn tree in! Found some pretty wide gold ribbon and some white iridescent ribbon, draped down the tree and then I carefully wrapped strings of pearls around as garland. Starting to feel a little bit better. Also decided to avoid the emotional landfills if at all possible - "those" ornaments could stay happily in the box. 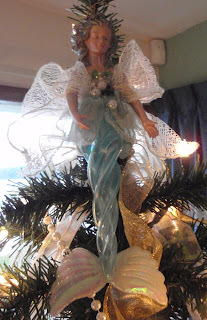 My glass aqua mermaid sits on top - I think she works just fine as an angel! 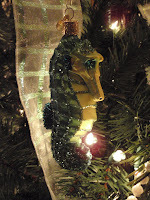 My glitter seashell ornaments came from a really cool company (a family in South Carolina) and they were sold in my Poulsbo store. 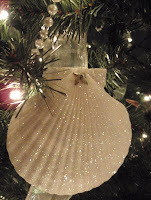 One year, when I called to order the ornaments, my friends that made these beautiful shells, just had their workshop wiped out in a hurricane that had roared up the coast, but they were still making and shipping the glitter shells on their kitchen table. Have to admire their perseverance! My gold seashells come from another small company, this time in Oregon - real shells dipped in 14K gold. LOVE these all year, not just for Christmas. 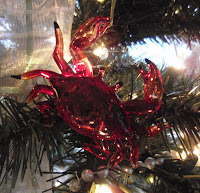 Wish I had kept more of these cute little red crabs! When I had them in the store, they were the first ornaments to completely sell out. Customers would buy handfuls of them for stocking stuffers and for using on wrapped presents. How long are you in San Fran (sorry I should probably know this).